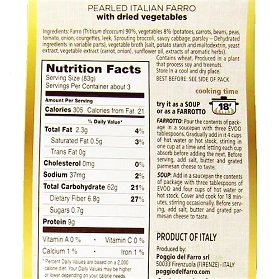 Enjoy two different , quick and easy meal options in one package of pearled Italian farro with dried vegetables. 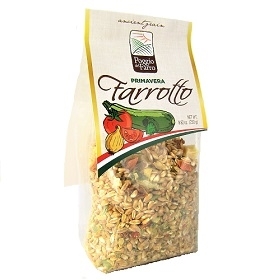 Prepare this as a creamy "farrotto" (similar to risotto) OR as a deliciously hearty soup. Just follow the directions on the package and either dish will be ready in 18 minutes. No added preservatives or artificial ingredients. 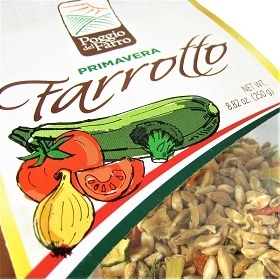 Ingredients: farro, vegetables (potatoes, carrots, beans, peas, tomato, onion, courgettes, leek, broccoli, savoy cabbage, parsley), vegetable broth. Contains wheat. 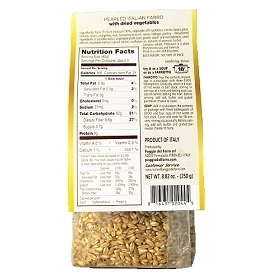 This packet provides an easy way to prepare a delicious farro dish that complements almost any entree. Hard to find in local stores.